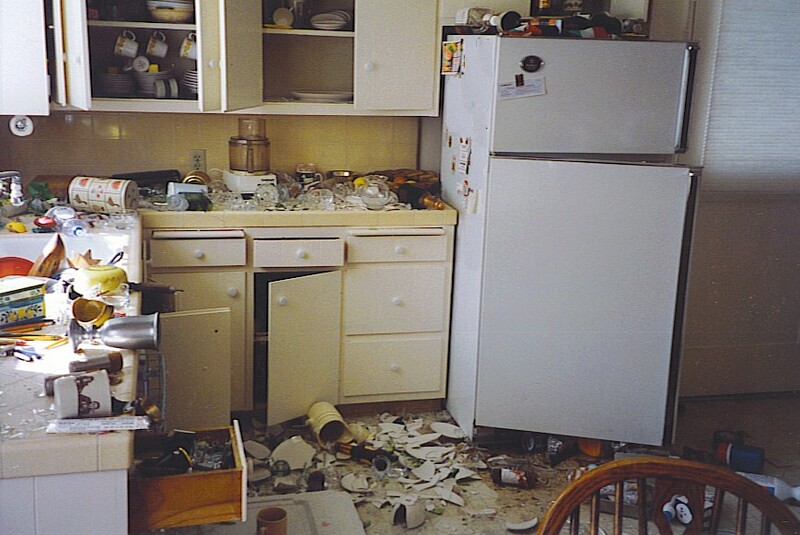 A 6.7 quake did this to our kitchen. There are no certainties in life, unless you live in California. Then you can be certain that another earthquake will be along shortly. As a native Californian, I have experienced scores — probably hundreds — of earthquakes. Most are relatively mild, only eliciting a wide-eyed response from those who have moved to the state within the last couple of weeks. Old-timers don’t feel them. There are some quakes, though, that rattle windows and rearrange furniture — when they occur, even veterans look at each other uneasily. Beyond those are the big ones that topple buildings and kill people. The intensity of each quake is quantified on something called the Richter Scale. It is another of life’s certainties that within minutes of an “event”, news outlets will check with the earthquake experts at California Institute of Technology so they can breathlessly report the quake’s magnitude: “It was a 5.3 on the Richter Scale,” the anchorman will say as if he knows what that means. Most anchorpersons, I’m fairly sure, don’t have a clue that the Richter Scale is a base-10 logarithmic scale derived from the horizontal amplitude of the largest displacement from zero on a torsion seismometer. In fairness, I didn’t have a clue either, and even after looking it up, I still don’t know what it means. Well, I do know this much: on the Richter Scale, the magnitude is ten times greater for each whole number. In other words, a 6.0 is ten times stronger than a 5.0. I also know that the scale is named for a guy named Richter. Charles Richter was a Cal Tech scientist who developed the scale in partnership with Beno Gutenberg in 1935. The name Gutenberg was already claimed by the inventor of movable type, which may be why Beno gets no credit for the earthquake scale. It probably also has to do with Charles Richter showing up at the press conferences, while Beno Gutenberg was notoriously shy. Even if you are not math-challenged (as I admit I am), the Richter scale numbers are difficult to comprehend. Two recent earthquakes illustrate the point. The January quake that devastated Haiti was measured as a 7.0; the one in Chile a month or so later was an 8.8 — almost twenty times stronger. I don’t know about you, but I have trouble wrapping my mind around such a vast difference, and what that must have felt like on the ground. Even though the math is much simpler, it is also hard to grasp the magnitude of earthquakes when measured in lives lost. There were 230,000 deaths in Haiti this year; about that same number died in the 2004 Indonesian earthquake. Throughout history there have been thirteen quakes that have each killed more than 100,000 people, including a mind-boggling 830,000 in the Shaanxi, China, earthquake of 1556. Viewed in that grim context, there are much worse places to be than California when an earthquake hits.